What are you really worth, any why? The value of tulips has changed dramatically, but their beauty remains the same. What are You Really Worth, and Why? How much are you worth? What are you basing your value on, and why? Looking at thousands of blooming tulips recently at the Philadelphia Flower Show, I was amazed at the diverse beauty surrounding me: white and yellow Angel’s Dream tulips with smooth wing-like petals, purplish Blue Parrot tulips with rippled petals, bright orange Ballerina tulips with petals that looked like dancers’ arms elegantly reaching upward. A new tulip variety that botanists developed just for the show made its debut: the Philly Belle, a deep red flower with fringed edges. The tulips at the flower show — America’s largest and oldest (since 1829) — were prized. They were carefully arranged by professional florists into creative designs, and then admired by thousands of visitors. These were celebrity flowers that were photographed and talked about widely. I couldn’t help but wonder: What about the tulips growing in places that were out of the spotlight, like those tucked away in the corner of a neglected backyard, or those blooming in the wild? Just because those tulips are noticed less, does that make them less valuable? Then I thought about the “Tulip Mania” in the Netherlands during the 1600s. After the Dutch brought tulip bulbs from Turkey to the Netherlands, the exotic tulip flowers became status symbols. Their financial value skyrocketed so high during the 1630s that the price of a single bulb for a rare tulip variety cost as much as an entire house. 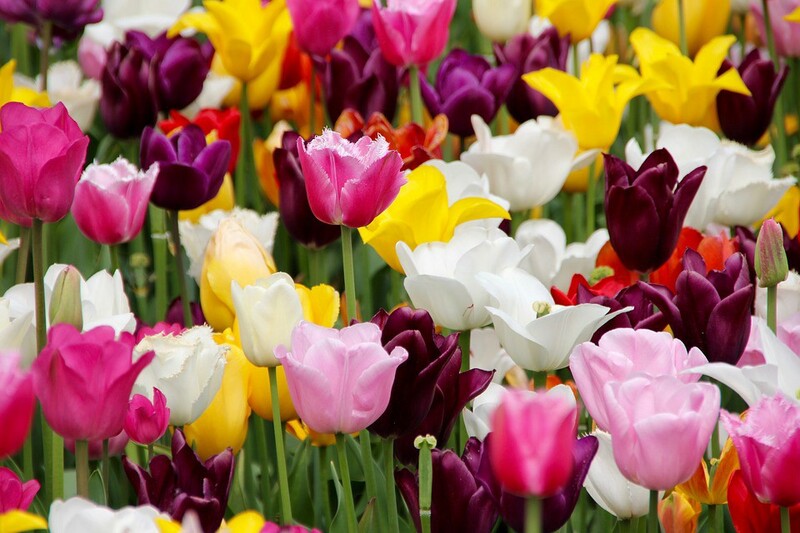 Men in love paid marriage dowries with tulips — just one bulb was enough for a father to give his permission for a daughter to wed. One unfortunate man mistook a tulip bulb for an onion and ate it. People were so outraged about that mistake that they sent him to jail. By 1637, however, the tulip bubble burst. Doubts crept into people’s minds about how much more tulip prizes could rise. Those doubts led to tulip prices plummeting. As a result, many Dutch families who had mortgaged their homes to buy tulips and resell them lost their fortunes and ended up in poverty. All through the dramatic financial changes, however, the tulips themselves remained the same. Their beauty was unchanged. So how much were they really worth? When it comes to the issue of confidence, we can learn a lot from tulips. Different people assign differing amounts of value to us. We set a certain value on ourselves, depending on our self-esteem. Just like what happened to flowers during Tulip Mania, our perceived worth can either skyrocket or plummet. But the fact remains that our real worth — our intrinsic value — remains unchanged. Who knows best what our true value is? I believe it’s the one who created us: God. As Creator of both humans and tulips — as well as a lot of other awesome living things — God says that we’re all valuable and worthy of love, no matter what. It’s not the circumstances around us or the opinions of others that determine our value. It’s simply the fact that the One who made us loves us. In fact, God loves us so much — completely and unconditionally — that our value is so high it’s actually unlimited. If we believe that, then it’s clear that we’re worth taking good care of, so we should always invest in our own well-being. Just like tulips sprout up through soil, absorb rainwater, and open themselves to the sun, we too should nurture ourselves with confidence. We have great intrinsic value. So let’s bloom and flourish! Whitney Hopler works as Communications Director at George Mason University’s Center for the Advancement of Well-Being (CWB) and has written for many media organizations, from About.com to the Washington Post. Connect with Whitney on Twitter and connect with CWB on Twitter and Facebook. Inspiration for living a life of well-being and wonder! God and people lover. Lifelong learner. Journalist who aims to inspire. Communications Director for the Center for the Advancement of Well-Being at George Mason University.